As a winter bride myself, I'm partial to a winter wedding. So, when Katie approached me about making some modifications to her dress for her December wedding, I was thrilled to help. 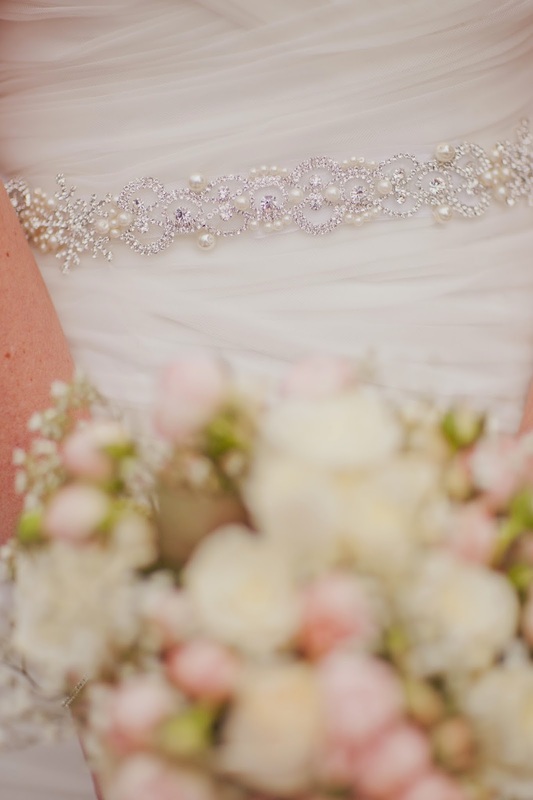 She had tried on a rhinestone belt at the bridal shop and liked the look, but not the price. Unlike the traditional belt, she actually wanted the embellishments sewn to her gown mainly due to the corset back on her gown. 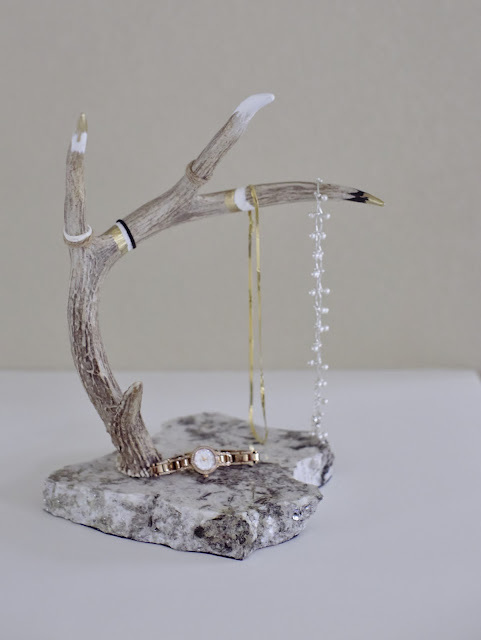 After chatting some more about her vision for her wedding, I started 'window shopping" on the internet to find just the right pieces to make her a one-of-a-kind look. 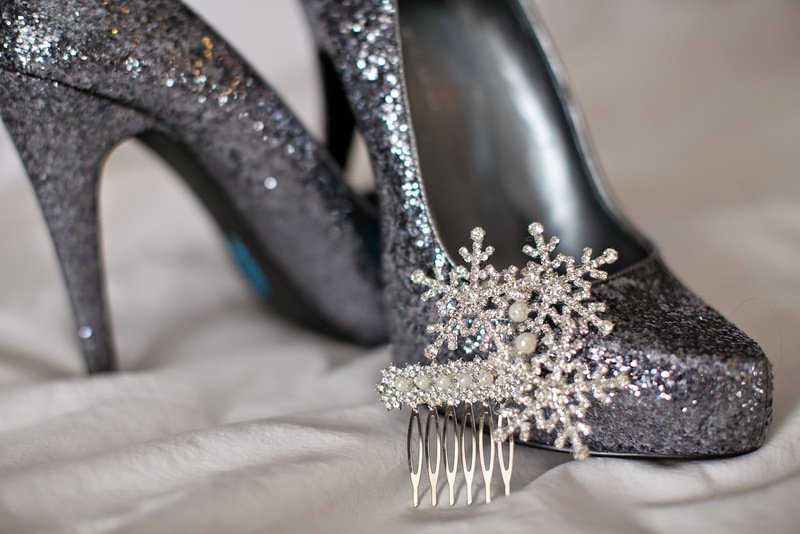 I was so tickled when I found a beautiful trim, and even more delighted when I actually found something when I googled "rhinestone snowflakes"! I chatted with Katie about my ideas to use the trim, snowflakes and pearls for just the right winter inspired belt and shared pictures as my ideas took shape (we were working from two different states). It was a great collaboration. I laid out the trim and began strategically placing the snowflakes and pearls. I was so pleased with the way it turned out. She looked absolutely stunning! 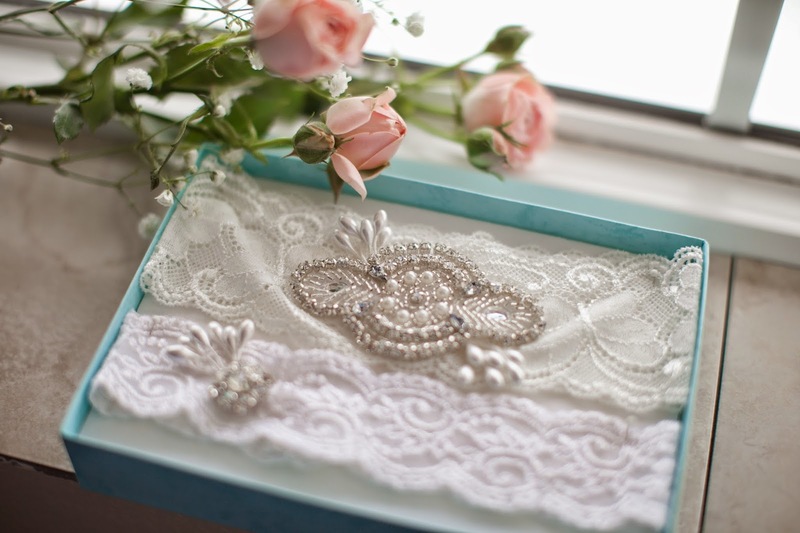 I was also honored to make her garter set, two flower girl baskets, and a haircomb that she wore during the reception. I continued to use the pearl and snowflake theme throughout all three pieces. So much fun! It snowed the night before the wedding adding a beautiful winter wonderland feel to the day and despite the frigid temps....Katie, her groom, and the wedding party braved the cold for some unique outdoor photos that only a winter wedding can have. Congrats! I decided to try my hand at adding a new Christmas cookie to my annual assortment. I realized just about every cookie I make has chocolate in it. So when I ran across this recipe and every review was positive, I decided this could be a keeper. And sure enough....it is! These babies melt in your mouth, a true tribute to their namesake....and a cookie with cream cheese frosting, really? How can you go wrong? The house smells so wonderful while these are baking, the smell of peppermint fills the air....put on some holiday music and you're instantly in the Christmas spirit! *The ingredients for the cookie dough makes about 24-26 cookies, however the frosting makes enough for a double batch of cookies. I would say, you're going to love these so much, you'll want a double batch! In a small bowl, combine flour and cornstarch; set aside. In another bowl cream the butter and powdered sugar. Add peppermint extract. Slowly add the flour and cornstarch mixture to the creamed butter and sugar. Combine well and refrigerate for an hour. After the dough has chilled, preheat oven to 350 degrees. Roll the dough into 1-1 ½ inch sized balls and place them 2 inches apart on a parchment lined baking sheet. Bake for 10-12 minutes in the oven until the edges start to lightly turn brown. Remove from the oven and let cool completely. To make the peppermint cream cheese frosting, cream together cream cheese and butter. Add peppermint extract and slowly add the powdered sugar. 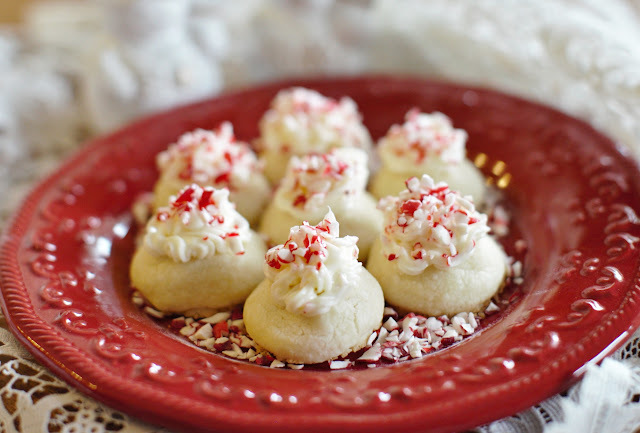 Frost the cookies and garnish with crushed peppermint candy canes, or Wilton has already crushed peppermint sprinkles! This was my first attempt using a pastry bag.....I felt like I'd watched enough cooking shows that I might be able to add a dollop to the top of each of these cookies. Success!!! Who knows, if I'm feeling brave soon, I may have to try frosting some cupcakes next. As with everything in life, the more projects I attempt (notice the choice of words? ..... I still make a lot of mistakes, and learn each and every time I make something) with my Silhouette Cameo machine, the more comfortable I become. The design was actually in the Silhouette library .... so I don't get any points for the design, but I do get points for turning the design into a gift card holder! The actual design I printed on white cardstock using my computer printer, then used the Cameo to cut the circular shapes and the "elf". I left an opening at the top, glued the rest of it together and then topped it off with some green beads for a little Christmas bling. Last step? Place the gift card inside, and slip it into a certain somebody's Christmas stocking and wait until 12/25! I asked for this recipe from a friend I worked with many years ago. She had brought a pumpkin roll for a bake sale/bake-off that we had one year. If I'm not mistaken, this recipe came in as one of the winners! It's not too heavy or overly sweet, with a cream cheese filling that works any time of the year...but for me, I love it as either a Thanksgiving or Christmas dessert. *you'll have enough in a small can of pumpkin filling to make two rolls; or use the leftover for something else. Preheat oven to 350 degrees. Spray a 15"x10" jelly roll pan with non-stick cooking spray; line with wax paper. Spray the top of the wax paper with non-stick spray. Combine flour, baking powder, soda, cloves, cinnamon and salt in a small bowl. Beat eggs and sugar in a large mixing bowl until thick. Beat in the pumpkin. Stir the dry ingredients into the wet ingredients. Spread evenly in prepared pan. Bake for 13-15 minutes or until the top springs back when touched. While the cake is baking, sprinkle a thin cotton kitchen towel with powdered sugar. When the cake is finished baking loosen and turn it face down onto the towel. Carefully peel off the wax paper. Roll the towel and cake together into a loose roll. Cool on a wire rack. Mix filling; unroll the cooled cake and spread the cream cheese mixture over the cake. Re-roll the cake. Wrap in plastic wrap and refrigerate for at least one hour before serving. Dust with powdered sugar prior to serving. I love the look of it too....so pretty and professional looking...but, it's not too hard to pull it off and look like a world class pastry chef for your friends and family! Enjoy! I've had this idea in my mind for a long time, and this year, I finally followed through on it. I started early since all of the Christmas items were available at Hobby Lobby before Halloween...so now that it's finished, it can be on display all season long. I have a thing about making sure Thanksgiving and Christmas are separate events, so my Christmas season doesn't start until after the Thanksgiving holiday is over. First, use the Mod Podge to secure the craft paper to the letters. When dry, apply two finishing coats allowing the first coat to completely dry before applying the second coat. Next find that special something that you want to use for the "O". This was probably the toughest part of the whole project....making the decision on what to place there! I was looking at big jingle bells, snowmen, you name it. But I settled on this beautiful little ceramic Christmas bird that I found at Gordman's at a very reasonable price. I chose to nestle him onto a piece of an Aspen tree limb from our backyard (we unfortunately had to remove nine trees from the yard since they were dying). We had the perfect leftover piece of wood in the garage that I could use for the base. A coat of red spray paint gave it some holiday spirit. The evergreen sprigs are made from a single "pick" from Michael's and the majority of the pine cones came from our front yard. Since the bird had a dusting of snow on him, I chose to add a bit of snow to the evergreen sprigs, the top of the "Y" and the wood base. The Snow-Tex is cool...it comes in a small jar and you scoop it out with a palette knife and apply it where you want it. As you can see, you can pile it up to make it really three dimensional.